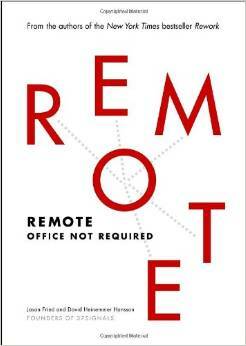 I’ve just finished Remote – Office Not Required, a book by 37Signals founders Jason Fried and David Heinemeier Hansson (also creator of the web framework, Ruby on Rails). Jason and David run the Basecamp project with great success using a small army of remote workers. This success has made them prophets who declare the benefits of remote work to companies who do not see its value, or fear it altogether. As a remote worker myself, who spends three days a week working from home, and two days in the office an hour and a half away in Cleveland, Ohio, I wasn’t sure if Remote would offer any nuggets about remote work that I didn’t already know and agree with. I was only partly right. Jason and David’s analysis of remote work gave me a greater appreciation for the paradigm and also for those companies that have embraced the remote workplace ideology, such as where I work at Within3. 2. Health – So I mentioned I love eating at restaurants. Food is definitely a passion of mine. But if I worked every day in a restaurant hub like Cleveland, my belt would be snapping off in a few weeks! Plus, the long commute would not offer me much time to exercise in the morning or evening during a work day. But since I work from home three days a week, after work, I can trade in what would be a long ride home in for a run (at least in the summer, winters in NE Ohio are awful!). That way I have more room to eat on the days I’m in Cleveland! 3. Time Flexibility – Remote work gives you the ability to get your average forty hours a week in any time during the workweek. My wife and I just had a baby, so that time flexibility really pays off when you are juggling work with visits to the midwife or pediatrician. 4. Productivity Analysis – When you are working remotely, you must be judged primarily on your ability to produce, not just where you are sitting from nine to five. It’s extra motivating to know that your project success rate is how your company will perceive your value to them. It forces you to manage your time appropriately to get the job done! 5. The Ability to Hire Talent Anywhere – For years, companies have been restricted to offering employment exclusively to home town boys and girls, or try to woo outside talent into the home office city. If the talent didn’t want to move, the company was out of luck. Now, with remote work options, great people can be hired from all over the world! And an added benefit is that if a current employee needs to move out of the home office city for whatever reason, the ability to work remotely could may keep them with the company, saving that company time and money in finding a replacement. Remote – Office Not Required is a book with a clear mission – to convince companies that currently do not offer remote options, or are skeptical of remote work, to embrace dramatic shifts in their thinking. It is also a rallying cry for those workers who are trying to convince their current employer to offer remote work options. But for people like me, who are currently enjoying those benefits already, it is valuable reminder to appreciate what you already have, the company leadership that makes that remote work possible!